Apparently they built the roof around this ride and you can tell when you ride it. The clearance at the top of the lift is very tight. Yes I did visit the water park. Galaxyland was my top priority, but I will have a report for that. It was probably the best water park I've visited not named Blizzard Beach. Loved your reaction shot on Mindbender! It's much like ours was, waaaay back in 2001. Glad to read you enjoyed the park. AND that glorious indoor waterpark! Looking forward to your take on that, too. I'm a little late to the party, but I enjoyed your Phoenix TRs. Desert Storm is such a weird coaster, but I think that's why I like it so much. 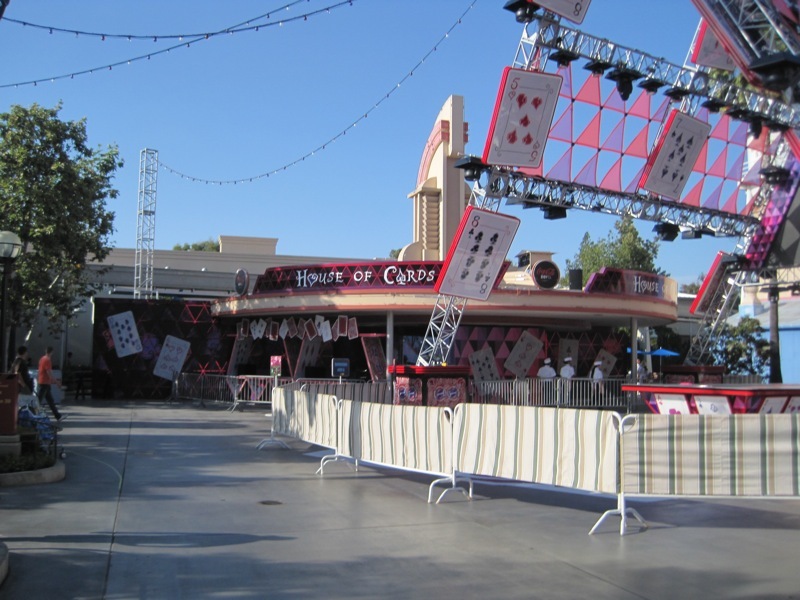 I visit Phoenix about once a year and always make sure to stop by Castles 'N' Coasters when I'm there. Desert Storm and all the weird Disney knockoff murals around the park are worth a trip to this park. I didn't even know Wildlife World was a thing; I'll have to check it out on my next trip. JimmyBo wrote: Glad to see you "enjoyed" what little this Grand Canyon State has to offer in terms of Theme parks. If you ever make it back out here, be sure to check Schnepf Farms. It is only open occasionally but it has the best coaster in the state. It may not be very tall but it sure has some "OH MY GOD WHAT THE HELL" airtime moments when you sit in the back. Dang, dude! I've visited Queen Creek Olive Mill a few times and had no idea there was a coaster right across the street. I'll have to check it out on my next trip. Nrthwnd wrote: Loved your reaction shot on Mindbender! It's much like ours was, waaaay back in 2001. Thanks! That's a neat frame; the photo I got was only the photo. joelwee wrote: I'm a little late to the party, but I enjoyed your Phoenix TRs. Desert Storm is such a weird coaster, but I think that's why I like it so much. I visit Phoenix about once a year and always make sure to stop by Castles 'N' Coasters when I'm there. Desert Storm and all the weird Disney knockoff murals around the park are worth a trip to this park. Thanks! Desert Storm was definitely off and I agree that's part of why I really liked it. If it had OSTRs, I'd be singing a different tune. If you are into big thrills and coasters, well Mindbender is pretty much all you are going to like there. It is a pretty average indoor park with mostly family rides. As far as size? It's a small park, I believe the one at Mall of America is much bigger and it has more variety. I hate how they put that spinner coaster right thru Mindbender too! I thought it looked better without that in the way. I really liked Quirks in the Works and Space Shot as well but Mindbender was definitely the ride I kept going on. I actually like how Galaxy Orbiter intertwines with Mindbender. It's neat seeing the track intertwine. I expected to like World Waterpark simply because indoor water parks are a novelty to me. But I did not expect to like World Waterpark as much as I did. It had an awesome collection of speed slides plus climate controlled water. I’m the type of person who visits water parks on the least ideal day (rainy, 65 degrees, etc) to avoid crowds, so 86 degree water was an absolute godsend. I felt like a shark out of water in 86 degree water, but it felt so right. This water park is the opposite of Splashin’ Safari. The only things this place has in common with Holiday World are friendly employees and free soda. While Splashin’ Safari consists entirely of tube slides, World Waterpark is almost entirely made up of body slides. Heck there were even 2-3 body slides with suspiciously oversized tubes that make me think they were once tube slides in another life. My back wasn’t thrilled at the prospect of body slides only, but these are the smoothest body slides I’ve ever ridden. Even the extreme drop pod slides were smooth as glass. These slides were the real deal and not that garbage from SplashTacular (if you’ve ridden SFNE or SFA’s Bonzai Pipeline, it’s them). So I guess I’ll start with Cyclone, the massive AquaLoop. I know there are taller water slides out there, but this thing looks colossal. The drop pod is mere feet from the roof. Even when the other slides built up queues, the drop pod slides were still walk ons. And it certainly isn’t because of their capacity. Pictures do not do these slides justice. They look massive indoors. Nessie's Revenge (purple) was unfortunately closed. Is it just me, or does the profiling look a bit (for a lack of a better word) triangular almost like Magnum's bunny hills? The lone tube slide I rode was probably the park’s most unique ride in Slideboarding. The rafts are heavy. They’re only for one person, but they have some serious girth to them. If you thought carrying those clover tubes up a tower was the Seventh Circle of Hell, you clearly haven’t been on Slideboarding. But the rafts are technological marvels. They turn an otherwise mundane slide into a game of Guitar Hero. You choose your song and during the descent, the trough is lined with colored lights. As you pass these lights, you need to select the same colored button on your raft. As an added bonus, it did have one very nice drop at the end. I’ve ridden my fair share of toilet bowl slides, but usually they’re of the tube variety. 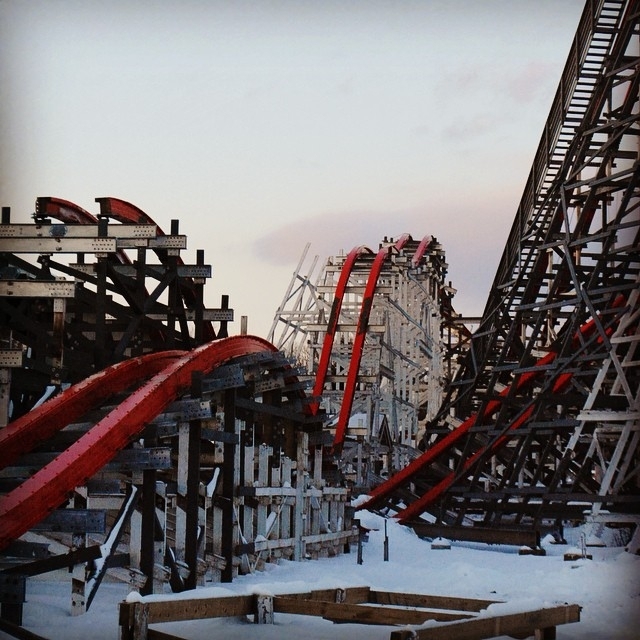 The only body slide version I’ve ridden was at Whale’s Tale. It was undoubtedly more thrilling and way more fun, but it was pretty uncomfortable on my back. I was worried Tropical Typhoon would be the same. What was probably a comical visual for the employees quickly turned into a murder scene. The sheer force of the water gave me a nosebleed. Fortunately, the employees were super responsive and had some towels handy. It was an unfortunate way to end the day, but I wasn’t going to risk closing down another slide for clean-up. The mall itself has plenty of viewing decks to showcase their neat water park. Logistically there are two confusing aspects with the water park. For one, the park entrance forces you through the fluffy, fluffy bunny filled with medicine and goo room. That part makes sense considering most patrons aren’t wearing a bikini around the mall. But the weird part is that you literally have to walk through the showers. Not around, but through. Picture a line of 20 or so people showering and guests awkwardly squeezing their way by. Finding the slide you want is like capturing the Golden Snitch. It can be done, but it's very hard. Or you could cheat and go ride this lonely slide off all by itself. On the day I visited, the World Waterpark had a sign out front they were closing 2 hours earlier than posted online. At first I thought it was because it was the offseason, but then I discovered it was because they were having a concert in the evening called SoundWave. They transformed their wave pool into the coolest dance floor I’ve ever seen. While I didn’t attend, I did peer in from the mall’s viewing deck and it looked like one heck of a party with all the strobes and music. It was a neat concept and I could see this going over well at other water parks. This is the best dance floor I've ever seen. It may just be the best water park I’ve visited outside of Blizzard Beach. I really have to flip a coin whether or not I prefer it to Splashin’ Safari. I know this site is more about theme parks, but this water park should not be missed in a visit to the West Edmonton Mall provided you enjoy body slides. Wow, World Waterpark seems like a really nice indoor waterpark, and it looks enormous. 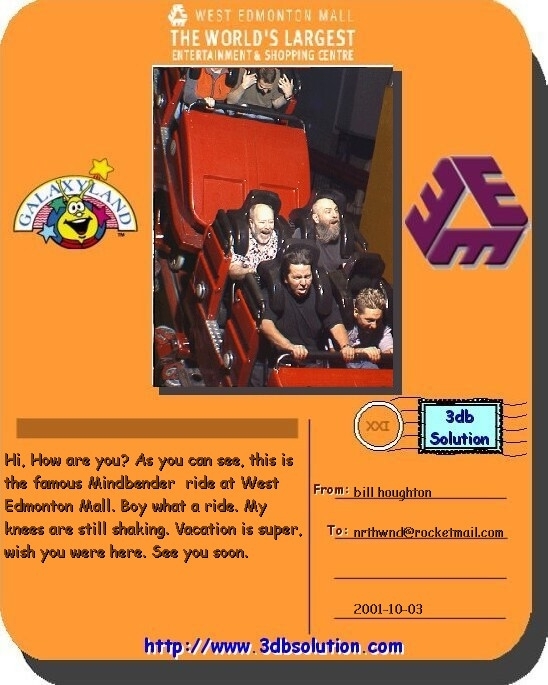 I would definitely love to visit Edmonton Mall at some point in the near future! I think I might’ve gone to World Waterpark as a young child... I might be going back to Edmonton to visit family this summer and that means an excuse for me to ride my #5 coaster and visit this amazing looking waterpark. It literally looks like the train is about to fall off. That's how abrupt the twists are.